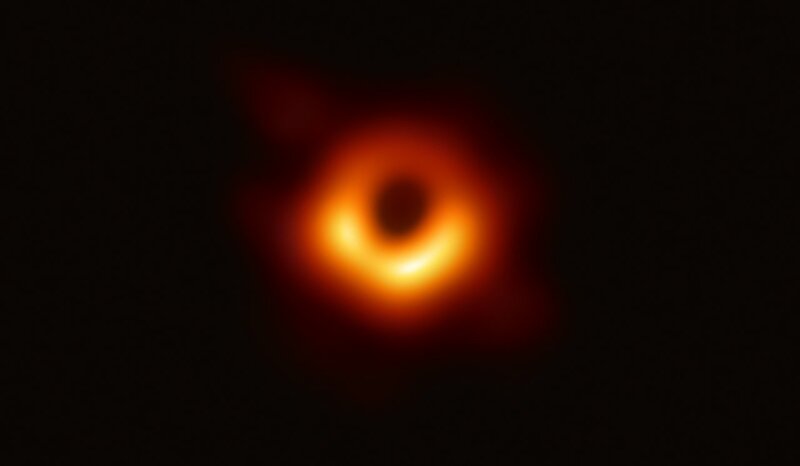 Watch the livestream of the press conference revealing the first image of a black hole ever taken. This historical event is being held at the European Commission’s Berlaymont Building, Brussels, Belgium. If you have questions for the panellists #askEHTeu on Twitter. Follow other updates at #RealBlackHole. Simultaneously press conferences are being held in numerous locations all over the planet. In 1919 the now famous Eddington expedition ventured out to see whether gravity can bend light — a major test of Einstein’s general theory of relativity. By viewing a total solar eclipse, they showed that the Sun did change the path of starlight just as predicted — making Einstein and his theory world-famous. Now, a whole century later, scientists set out again, to even more remote locations scattered across four continents. They pushed the limits of astronomical knowledge, testing the same theory in a way Einstein could never have imagined. Their goal: to take a picture of a black hole, something so ambitious that it seemed impossible...until now! The paradigm-shifting observations made with the Event Horizon Telescope — composed of ALMA, APEX and six other radio telescopes — have produced an image of the gargantuan black hole at the heart of distant galaxy Messier 87. The image shows the shadow of the supermassive black hole against the disk of superheated plasma surrounding it. A historical first! Humankind’s first image of a black hole. The 17-minute film In the Shadow of the Black Hole explores the efforts that led to this historic image, from the science of Einstein and Schwarzschild to the struggles and successes of the EHT collaboration. The 17-minute film In the Shadow of the Black Hole. The EHT collaboration involves more than 200 researchers from Africa, Asia, Europe, North and South America. Over six months they worked with more than 50 science communicators in an unprecedented collaboration to produce a joint press release explaining all about this discovery. The light rays in the vicinity of the event horizon of a black hole are bent by the strong gravitation near the event horizon. This is the cause of the shadow captured by the Event Horizon Telescope. In an eerie display of some of nature’s most fascinating optical trickery we are looking at the black hole from all sides at the same time. 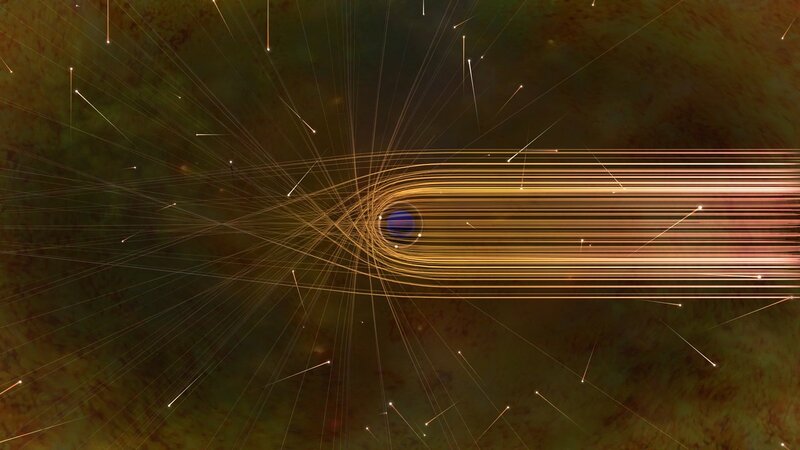 This artist’s impression depicts path of light rays around the black hole. Hear from some of the people how they were involved at the front line of this endeavour, and about the enormous efforts involved in such an astonishing achievement. Join the Reddit Ask Science “Ask Me Anything” session on 10 April, 20:00 CEST. Have a conversation with some of the scientists behind this result on Reddit, on 10 April, 20:00 CEST. This video starts with a view of ALMA and zooms in on the heart of Messier 87 visible in the constellation Virgo. Along the 55 million light-year journey successively more detailed observations are shown, culminating in the first direct visual evidence of a supermassive black hole’s shadow. 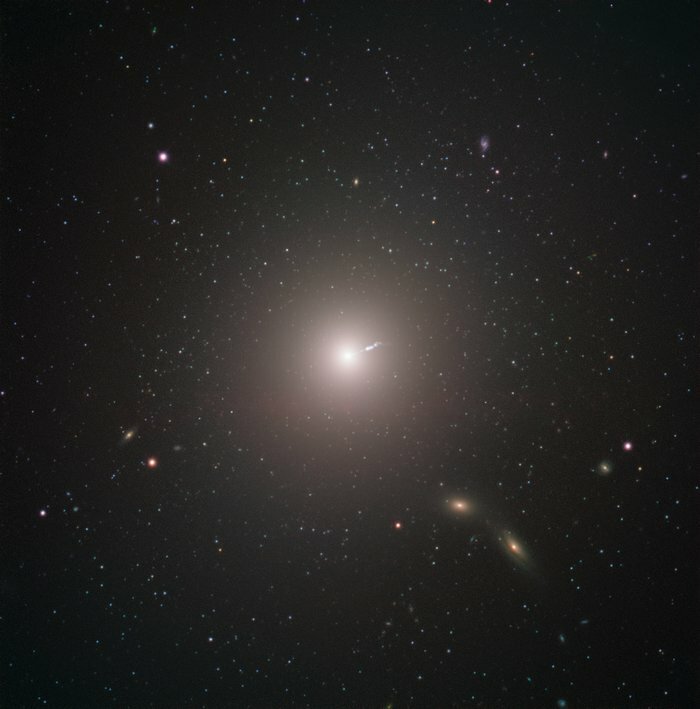 The galaxy that was chosen for this study, Messier 87, is an enormous elliptical galaxy located about 55 million light-years from Earth. Just as with all other large galaxies, Messier 87 has a supermassive black hole at its centre. The mass of the black hole at the centre of a galaxy is related to the mass of the galaxy overall, so it shouldn’t be surprising that M87’s black hole is one of the most massive known. The black hole also may explain one of the galaxy’s most energetic features: a relativistic jet of matter being ejected at nearly the speed of light. This image was captured by ESO’s Very Large Telescope as part of the Cosmic Gems programme. The EHT observations use a technique called very-long-baseline interferometry (VLBI) which synchronises telescope facilities around the world and exploits the rotation of our planet to form one huge, Earth-size telescope observing at a wavelength of 1.3mm. VLBI allows the EHT to achieve an angular resolution of 20 micro-arcseconds — enough to read a newspaper in New York from a café in Paris. Each telescope of the EHT produced enormous amounts of data – roughly 350 terabytes per day — which was stored on high-performance helium-filled hard drives. These data were flown to highly specialised supercomputers — known as correlators — at the Max Planck Institute for Radio Astronomy and MIT Haystack Observatory to be combined. They were then painstakingly converted into an image using novel computational tools developed by the collaboration. This animation shows the locations of some of the telescopes making up the EHT, as well as the long baselines between the telescopes. In anticipation of the first image of a black hole, scientists built a simulation of one of these fascinating astrophysical objects. Their simulation shows a black hole surrounded by luminous matter. This matter disappears into the black hole in a vortex-like way, and the extreme conditions cause it to become a glowing plasma. The light emitted is then deflected and deformed by the powerful gravity of the black hole. The construction of the EHT and the observations here represent the culmination of decades of observational, technical, and theoretical work. This example of global teamwork required close collaboration by researchers from around the world. Thirteen partner institutions worked together to create the EHT, using both pre-existing infrastructure and support from a variety of agencies. Key funding was provided by the US National Science Foundation (NSF), the EU's European Research Council (ERC), and funding agencies in East Asia. European facilities and funding played a crucial role in this worldwide effort, with the participation of advanced European telescopes and the support from the European Research Council — particularly a €14 million grant for the BlackHoleCam project. Support from ESO, IRAM and the Max Planck Society was also key. The discovery here has its foundation in research done over the past 100 years. This timeline provides an overview. The eight telescopes contributing to this result were ALMA, APEX, the IRAM 30-meter telescope, the James Clerk Maxwell Telescope, the Large Millimeter Telescope Alfonso Serrano, the Submillimeter Array, the Submillimeter Telescope, and the South Pole Telescope. Artist’s impression of the Black Hole at the heart of M87.